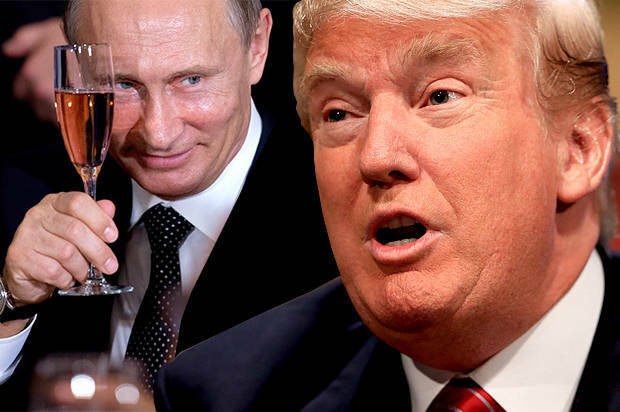 Unless you understand that there is a resource war happening, the events of Trump’s rise and his alignment with Putin cannot be properly grasped. It would be so simple for Trump to offer some surface criticism of Putin in order to quell his own critics who say he’s a Russian stooge. Trump’s refusal to do so is telling. His potential appointment of ExxonMobil CEO Rex Tillerson as Secretary of State nakedly reveals what this unholy alliance is all about: oil money. Of course, Tillerson has no diplomatic experience that would qualify him to act as Secretary of State. But his expertise in the oil markets makes him the perfect hatchet-man for Trump’s pro-Russian oil ambitions. About 50% of the Russian economy is based on oil. But the sanctions against Russia for their invasion of Crimea have squeezed them out of the oil market, severely threatening their economic stability. Combine that with the rise of fracking and the global drop in oil prices, and suddenly the Russian economy has very little to stand on. So in order to continue Putin’s ambitions to revive the Soviet-era Russian expansionism, he had to find a way to remove sanctions blocking the $500 billion oil deal with ExxonMobil. This deal is so huge that it would singlehandedly secure Russia’s economic stability for decades by insuring that Russian oil would be sold internationally instead of remaining uselessly in the ground. Of course the Paris Climate Agreement is another obstacle here and so Putin has a vested interest in undermining that deal as well. So how can Putin pull this scheme off? By electing Donald Trump. As president, Trump will have the power to do away with sanctions against Russia and while he won’t be able to undo all of the Paris climate accord, he can certainly undermine it simply by doing nothing. By opposing climate activists, Trump can help keep Russian oil out of the ground and burning. A potential Secretary of State Rex Tillerson could help push the ExxonMobil deal through, reviving both the Russian economy and the bank accounts of ExxonMobil. And let’s not forget that Trump’s many business dealings in Russia mean he also has a financial stake in the prosperity of the Russian economy. Favorable oil deals with Russia mean favorable business deals for Trump’s property investments. The brazen, naked quid pro quo here is astonishing in its audacity. The political maneuvering and gamesmanship that produced Trump’s historic upset is almost admirable if you ignore the fact that an alignment between the leaders of the United States, Russia and ExxonMobil – the corporation singlehandedly responsible for promoting climate change denial – is a direct threat to human civilization and the planet itself. Scientists have already warned that the remaining oil in the world must stay in the ground in order to prevent catastrophic extinction level events. But for the cold, hard practitioners of realpolitik, such concerns are trivial compared to the desire for money. At least Putin can be forgiven for wanting to return his country to its former glory and his willingness to cross lines to do so. But Trump and Tillerson have no such idealistic excuse, and are simply motivated by pure greed and nothing more.